"Polyurethanes are the only class of polymers that display thermoplastic, elastomeric, and thermoset behavior depending on their chemical and morphological makeup." This is nearly an entirely true statement. Polyurethanes can show a vast array of mechanical behaviors . Surprisingly, this versatility arises only from a fundamental weakness in polymeric nomenclature. Addition polymers such as polyethylene, polypropylene and poly(vinyl chloride) are named based on the narrow set of monomers used to make the polymer and therefore the properties of resulting polymers are equally narrow. Contrast this with polyurethanes, polyureas and other condensation polymers that are named on the linkages that form during the polymerization. Since we are naming the polymers only on bonds that form from very small segments of the monomers, the balance of the monomer is free to be practically anything and therefore the polymers' properties can be too. Knowing this then allows us to expose the weakness in the statement that ONLY polyurethanes show this vast array of properties. Start by looking at other condensation polymers. First, there is the kissing cousins of polyurethanes, polyureas, which can be just as versatile. Polyesters would be another class of materials with a vast array of properties. While polyethylene terephthalate (PET) gets the lion's share of the attention when the word "polyester" is mentioned, unsaturated polyesters are used as adhesives and thermosets and behave quite differently than PET. Thermoplastic copolyesters also exhibit highly elastomeric properties. I could go on with other examples, but I also want to return to the previous statements about addition polymers. Consider acrylics. While these are addition polymers, they also vary just as vastly as polyurethanes in their properties, but that is a result of three factors. First, there is the richness of the chemistry that can be done to modify acrylic acid giving a huge array of monomers that all fall under the heading of "acrylic". Secondly, the polymerization chemistry allows for the extensive use of comonomers. Lastly, and probably most importantly, it is very easy to polymerize acrylics - it can be done at room temperature with minimal amounts of equipment. Contrast this with polyolefins which are made only at very large scale with industrial equipment at high pressures and temperatures using air-sensitive catalysts. If you want a special copolymer of ethylene, hexene and decene, you better be prepared to order several million pounds of it. If you want a special copolymer of methyl methacrylate, 2-ethylhexyl acrylate and acrylamide, you can make it yourself this afternoon. The same is true with many polyurethanes - you can easily mix them up in your lab, no special equipment needed. Which then raises the question of what is the ultimate range of any given class of polymers? In many cases, we are limited to what is commercially available even if greater versatility is theoretically possible, and then limits our thinking about what that class of polymers is like, even if large. Regardless, polyurethanes are not the ONLY class of polymers to display thermoplastic, elastomeric and thermoset behaviors. Not at all. I've posted in the past that whenever someone tosses me a sample and asks "what's this polymer? ", polyurethane is never a wrong answer - you can probably make a polyurethane that would come close to mimicking that sample. Remember Newton's Third Law of Isocyanate Chemistry - "For every isocyanate/polyol reaction, there is an equal but faster isocyanate/polyamine reaction"
Somehow I managed to stumble across the blogPlastic is Rubbish, a blog anonymously written about the efforts of two people to live plastic free. The title of the blog is misleading however; it should read "This Blog is Rubbish". One of their more significant posts is The A to Z of Plastic Free Living. I won't go down the whole list, but even the first item, antiperspirants, shows how unsophisticated the approach is as it takes the standard rant against the aluminum salts in antiperspirants being toxic, only to then suggest using ALUM as an alternative. (Psst, alum is an aluminum salt). The author, ironically named "Polythene Pam", goes on happily that since it "comes in a small cardboard box [sic]", it is plastic-free. Unfortunately this is not true, as the cardboard box is sealed with an adhesive which is plastic, and it appears from the picture on the webpage that there may well be a plastic coating on the paperboard that makes up the box. And this all overlooks the various petroleum-based resins in the inks. The next item up, antisceptics, the author already concedes is NOT plastic free in it's packaging. So yes, an A to Z guide on plastic free living that the authors themselves admit isn't all that it is claimed to be. I'll do one more item - it's a doozy - and then stop. The third item in this list is baking cups. As Polytheen Pam states, "Back in the mists of time I wrote of reusable cup cake cases. I was pleased that they were reusable but sad that they came in plastic packaging. Well I am sad no more. these [sic] scilicone [sic] reusable cupckaes [sic] come in cardboard packaging." So now she thinks that silicone is not a polymer (and again overlooks the plastic adhesive used to seal the box shut, and the possible coatings on the paperboard and the resins in the inks). Living plastic free is impossible. Living a vegetarian or vegan lifestyle is something that can be accomplished, as can abstaining from alcohol, tobacco, red meat, drugs, electricity and a vast number of other consumables. Plastic is just not one of them. 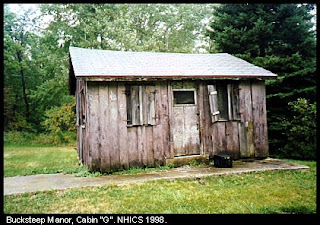 Short of going completely "off the grid" and becoming a hermit, a desert rat, a lone wolf or any other type of loner that doesn't participate in society and lives in a shack like this one, you cannot live plastics free. You can only reduce the amount of plastics that you use. To put on airs of superiority and accomplishment for living plastic-free is to exhibit not only ignorance of how pervasive plastics are in modern civilization but also lies to others that it can in fact be accomplished. At first I was scowling, but I've gradually warmed up to the idea of advertising using the phrase "Nobel Prize-winning technology". As far as the public is concerned, the Nobel Prizes are announced in early October, including the one for chemistry, and the announcements include the usual, obligatory hype about what the discoveries have or could be used for. But these announcements are all so vague. Does the public ever make the connection that something that they interact with is actually Nobel Prize winning material? As chemists in constant need for improving the public's image of our profession and our industry, we should talk about that link wherever and whenever it occurs. The Nobel Prize isn't something that is won and put on a shelf - the discoveries have improved lives of people around the world, but yet few in the public make that connection. Maybe part of our problem is that we focus too much on the latest Prize - who won last year. We're human and love the latest and greatest discoveries; prizes from 20 years ago are now in textboos. Yet in many cases, the recent winners' discoveries are often too new to have been commercialized. Look at the 2000 Prize given to Heeger, MacDiarmid and Shirwakawa for the discovery of inherently conductive polymers. There is tremendous future potential for these novel materials, but the consumer applications are still extremely limited if non-existent, even after 13 years. But when the these polymers do start appearing in the iPhone 7 or the whatever innovative consumer product takes the world by storm, there should be a loud and constant recognition that this phone was made possible by Nobel Prize-winning technology in Chemistry. Leaving aside chemistry in general and focusing on just polymers, almost every piece of polyethylene and polypropylene produced around the world is the results of Nobel-Prize winning technology - Ziegler-Natta catalysts (awarded in 1963), and derivatives thereof. Would the public view "cheap, junky plastics" any differently if we started telling them that there is Nobel Prize-winning technology associated with it? How about we start telling them so? "Cheap, junky plastic?" I don't think so. It's the stuff of Nobel Prize dreams. For reasons that I can't understand, too many people use their cellphones in restrooms. [*] I'm not talking about ringers going off when someone calls or texts a person, but rather that the phone is being used to talking/texting while the person is engaged in waste disposal. Standing at the urinal or sitting on the stool, it doesn't matter - too many people won't let go of that connectivity for even the few minutes that the nature break requires. "During the [charging] operation, 2 outgoing calls were made, 2 text messages were received and 1 was sent, and Bluetooth was enabled for synchronising with another handset for file transfer." No longer will we be unable to answer that call/text at the urinal because our phone battery is low; just empty your bladder and watch the meter climb. Thanks Science! [*] Well, at least too many men. I cannot report on what occurs in women's restrooms. I hope that they have behave better than men. The long awaited lawsuit between Eastman Chemical and Plastipure/Certichem is about to start. Eastman filed the suit after Plastipure claimed that Eastman's BPA-free, polycarbonate alternative, Tritan had shown estrogenic activity. I've been following this lawsuit closely for a number of reasons. First, I thought that the original research published by Plastipure that started this whole mess was a stinky pile of excrement and said so just 5 days after the report went online [*]. This commentary was eventually picked up and reported by PlasticsNews. Lastly, I was contacted by Eastman's legal team to assist in the case, but due to personal issues at the time, was sadly unable to do so. It was readily apparent from the research article that Plastipure had published the article in an effort to increase business for it's Certichem partner (many of the Plastipure employees also work for Certichem) and so it was with feelings of schadenfreude that I read about the hardships this suit has caused Plastipure. "If Eastman prevails, it will probably mean the end of PlastiPure and CertiChem. The suit has already caused big problems for the companies, says Mike Usey, the CEO of PlastiPure. 'More than half the people that were at CertiChem and PlastiPure before the suit are now gone'...". "Even so, Usey says he's optimistic about the companies' future. 'One of the good things that should come out of this suit is more consumer awareness of what the real issues are and what solutions are immediately available.' ". The "solutions [that] are immediately available" of course, are the solutions that Certichem provides. Much as we try, we cannot prevent flawed scientific research from getting published. Fortunately, mechanisms exist for correcting the technical literature, albeit at what can be a very slow pace at times. But when flawed research is used for economic gain, that needs to be pointed out and dealt with quickly. Sadly, lawsuits are not about finding out the truth, but rather about dispensing "justice", and there can often be a profound gap between the two. Hopefully that will not be the outcome of this case. [*]The researchers attempted to perform accelerated aging on the plastic samples but failed miserably at the attempt. For instance, they used 254 nm UV light to simulate sunlight, a crazy idea since sunlight at the earth never gets below 280 nm. As a result, they were running UV-initiated, chemical reactions that will never occur in any natural environment. Further, they never analyzed the samples for what new chemicals they created, and didn't attempt to find out if these new chemicals were what were causing the estrogenic activity. In the same vein, to simulate multiple dishwashing cycles, they put the samples in an autoclave, reaching far higher temperatures than would ever occur in a dishwasher. And so on. The bottom line is that they knew nothing about accelerated aging and it shows. There was a large fire at a plastics recycling plant in Sheffield, England on Sunday. Fortunately, no one was injured. 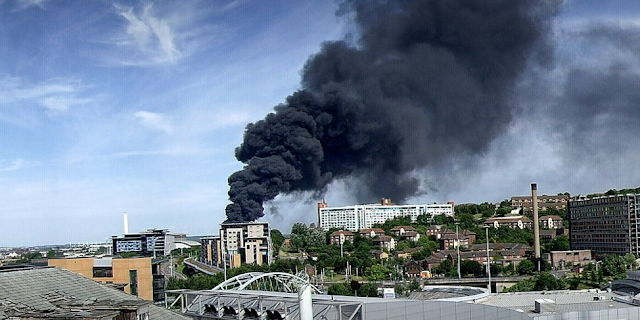 The BBC has some pictures of the thick, black smoke. Fighting fires of burning plastic can be a rather hazardous challenge, far more than fighting just a wood fire. While the theoretical combustion products of most polymers such as polyethylene, polypropylene, polystyrene, polyester and even polycarbonate are the fully-oxidized molecules of H2O and CO2, that is seldom the reality. Instead, fires of a pile of plastic destined for recycling are usually an oxygen-starved environment, and goodly amounts of CO and smoke particulates will also be produced. The carbon monoxide is a rather toxic gas and the particulates obscure the vision of the firefighters. Looking at the pictures, you can only imagine how blind the firefighters would have been had they attempted to enter the building. But these are the simple cases where the polymers are made of just hydrogen, carbon and maybe oxygen. Once the plastics start having additional elements in their makeup, the byproducts of incomplete combustion become far more serious. Consider nylon and polyurethanes where the nitrogen atoms become part of hydrogen cyanide gas. Or vinyl (polyvinyl chloride), which gives off HCl as it burns [*]. And heaven help you if there is burning Teflon around throwing off HF. I've only named the largest components from the incomplete combustion - a whole plethora of gases too numerous to name are produced in lesser quantities. Since this plant in Sheffield was recycling a wide range plastics, they probably had onsite most of the polymers listed here and maybe some others not listed. These are all hazards of fires in modern structures and something that firefighters face nearly every time there is a call (wild fires being the notable exception). Buildings are not just made of wood. Instead, a variety of materials are found inside, many of them plastics and rubbers, all of which give off these hazardous gases that are arguably far more toxic than the standard concerns of heat, smoke and carbon monoxide. All of which is another reason to appreciate the people who respond to our calls for help. [*] I once worked at a facility that processed lots of vinyl and so the operators all received special training for fire fighting. My special training consisted of being told to quickly get out the building and taking as many people along with me as I could. Fortunately, that training was never applied. Regulations can be headscratching at times, all the more so with FDA regulations. The latest example is the ban on BPA in infant formula packaging despite the fact that manufacturers have already voluntarily removed BPA from that packaging. While the ban will ensure that manufacturer don't change their mind and move back to using BPA, the ban still makes little sense as the "...FDA said it still considers BPA to be safe for packaging, but took its action because manufacturers have already abandoned its use in baby formula packaging. The plastics and chemical industry also said the move had more to do with market forces than chemical safety." So the FDA banned a safe material which no one is using anyway. I feel much safer. I'm glad to see that this agency has all the other serious issues of the day under control and can now be concerned about such minutia. The Institute of Chemical Engineers in England is now offering a 5-day course in "Chemical Engineering for Scientists". Having gotten all three of my degrees in chemical engineering, yet spending most of my career doing chemistry, I can well appreciate the differences. Sadly, I don't think the chasm needs to be all that great. Much of it could be shortened by chemists being taught some physics that they are not normally exposed to. In particular, the subject of transport phenomena. A number of years ago, a very good chemist friend of mine was trying to dry a coating in a continuous oven. The coating wasn't drying and so she kept turning up the oven temperature (slowing down the conveyor was not an option). Eventually the oven was hot enough that it dried the coating, but it also scorched it too. My suggestion was to lower the temperature and increase the air flow rate, a suggestion that solved the problem, and a perfect example of how knowledge of transport phenomena can be extremely helpful. A couple of weeks ago, I spent a post bashing a proposal to incorporate polymers into the chemistry curriculum, despite polymers becoming more and more a significant part of modern civilization. If a similar proposal were made to incorporate transport phenomena into the chemistry curriculum, you would be hard pressed to find a stronger supporter. Such a proposal would fit right in line with what I had suggested a chemistry education should be - fundamentals that can then be applied to numerous situations. And that well describes transport phenomena. Not quite a year ago, I posted what I thought was a tongue-in-cheek entry about the suffix "-omics" and how it should be used in polymer science in order to increase the field's relevancy. It included such extreme examples as "Mark-Houwink-Sakurada constantomics" and "Time-Temperature Superpositionomics". The first line of the paper is "Advanced mass spectrometry (MS) techniques have been used for many different fields such as proteomics, metabolomics and lipidomics for a long time." Yep, they fell for this -omics meme hook, line and sinker. It was a joke people, a joke. The most bizarre term in all of polymer chemistry, and probably organic chemistry as well is that awful word from polyurethane chemistry that sticks to your tongue and leaves your mouth with all the ungainliness of a 3-legged horse wearing a cast and using crutches - "allophanate". Pronounced as "al-LOFF-a-nate", the term describes the product of a reaction between a urethane and an isocyanate. That -N-(C=O)-N-COO- entity is what the fuss is all about. Take a course in polyurethane chemistry and you will encounter the term from anyone trying to impart a "complete" knowledge of urethane chemistry upon your brain. Although a common reaction for isocyanates is to form urethanes upon addition of an alcohol, formation of allophanates from the excess isocyanate is rather uncommon as the reaction is much slower than the primary with alcohols is. I did some digging to find origin of this putrid term and was surprised that it has actually been part of the chemical literature for almost 170 years. It turns out that a certain J. Liebig and F. Wöhler [*] described the formation of allophanic acid in the March 1, 1847 edition of the Chemical Gazette. Allophanic acid was the product of a reaction between cyanic acid and alcohol. Being the good chemists that they were, they immediately starting making esters of it - hence allophanates. The Merriam-Webster online dictionary gives the etymology of the word as coming from the Greek allophanes, meaning "appearing otherwise". Since isocyanates also react with amines to make ureas, you shouldn't be surprised to find that there is an amine analog to the allophanate called a biuret, a term that is just another ho-hum chemistry term, but it sort of makes sense as the grouping is 2 ureas sharing a common nitrogen atom. What is rather strange however, is that there are mentions from long ago of a biuret also being called a allophanamide. After about 5 tries at pronouncing this and in most cases giving up halfway through because things were just falling completely to pieces, I think it would likely be pronounced as al-lo-PHAN-a-mide. So answer me this: Somehow the allophanamide was able to cast aside it's horrible birthname - how come we can't do the same for the allophanate? [*] Oh great! Now I'm picking a battle with the founders of organic chemistry! Working with polymers at the lab bench is usually quite different than working with them at a larger scale (pilot plant, production, etc.). Benchtop versions of blown film lines, injection molders, extrusion lines...don't exist. Small extruders exist, but they don't have mass-loss feeders, custom screw elements and a whole host of other features that their big-boy versions have. And so at the benchtop we cheat. We use solvents to dissolve the polymers, which then allows us to easily stir in additives or other materials. We eventually have to get the solvent out, but that is usually pretty easy. Depending on the volatility of the solvent, a hood can work just fine. In other cases, an oven or a hot plate will do nicely. In short, the solvents make our lives much easier. In contrast, solvents at a large scale are generally avoided. Not only is flammability a concern (which then leads to higher capital equipment costs for the electrical equipment to make it non-sparking) but also the solvents need to be either recovered (more capital equipment) or oxidized (more capital equipment) which leads to CO2 emissions. But at the most basic level, the solvents are an added cost. If your material is coming into the plant as 67% solvent, that means that for every 3 pounds of it you buy, you are only getting 1 pound of final product material. (A fellow engineer assures me that the same results are true if the metric system is used, but I remain suspicious!) As a result, pilot plants and production equipment are usually solvent free. This differences in processing options with the size of the operation can lead to real nightmares in scaling up products. You can dissolve a newly-developed polyolefin in hot decalin and add in all the antioxidants you want, but you can't find out if it will make a nice blown film until you go to the pilot line. Even a cast film of the polyolefin will not provide meaningful samples as they would be completely lacking in the strength-inducing orientation that the blown-film line provides. One exception to this in the past has been coating operations. When I used to work for an unnamed Minnesota-based Mining and Manufacturing company making pressure-sensitive adhesive products, many of the tapes were made by coating solvent dispersed polymers onto the tape backings and then drying off the solvent in a belt-fed oven. I suspect that most of those solvent-based systems are long gone, replaced either by water-based substitutes or hot-melt based systems, which was my contribution to the cause back in the day. But as we continue to move more-and-more into a solvent-free production world, even this exception will disappear. The bottom line is that as time goes on, it is becoming increasingly difficult for benchtop operations to mimic production results. Surprising, isn't it?